While the goal of these new guidelines is “to ensure consistent, predictable, and correct application of these principles across the agency,” we’ll have to wait and see how it truly impacts rejections and, ultimately, allowances. For now, past examiner behavior is still the best indication of the possibility of an allowance. We worked with our data science team to determine which examiners currently issue the most Alice rejections, and did a quick comparison of their current allowance rate to those before the impactful Alice decision. We then limited our pool of examiners to those who had considered at least 150 applications with these parameters. This way, we’re reviewing the behavior of examiners with the most Alice experience, rather than those that come across these applications sparingly. 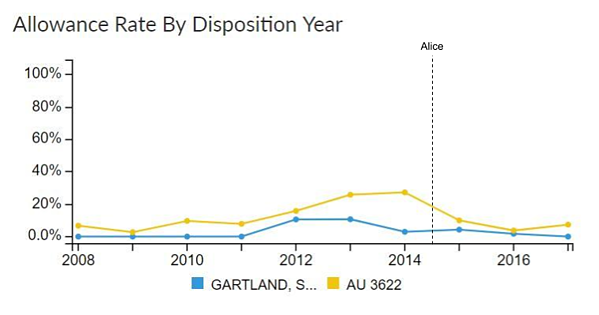 Through our analysis, we identified the ten USPTO examiners that have had the highest percentage of applications with at least one Alice rejection. If past behavior is the best predictor of future action, these are the examiners most likely to issue Alice rejections. The January 2019 guidance offers more clarity, which should lead to a decrease in Alice rejections. (We’ll be keeping a close eye on that, of course!) However, adaptation to regulatory standards – 2014’s Alice decision, in particular – may have more of an impact on some examiners than others. We used Juristat Examiner Reports to compare overall allowance rates (excluding design patents) for these ten examiners before and after 2014. While the Alice decision came mid-year, this comparison still gives a general sense of the impact it may have had on these examiners. 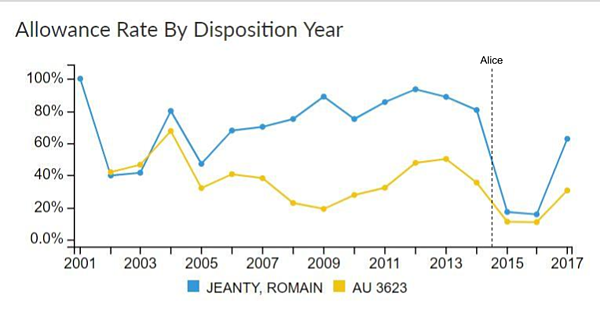 Juristat Examiner Reports detail each USPTO examiner’s rejection history, allowance rates, and more. Patent attorneys and agents often use our examiner data to set client expectations and tailor prosecution strategies. Using these reports, we can also reveal individual examiner trends over time. For example, if we look at the examiners from our list with the highest and lowest overall allowances rates, we can track their unique behavior. Then we have Scott Gartland, who has been working as an examiner since 2008. Even before Alice, he was a difficult examiner, with a career allowance rate of just 5%. The Alice decision did impact his already-difficult track record, but only slightly. After nearly five years of frustrating Alice rejections, we’re hopeful that the new USPTO guidelines will follow through on the promise of more consistent application. We’ll be following these examiners, and the USPTO overall, closely over the coming months.